Create a beautiful, customized color palette for your WordPress theme, using Gutenberg. 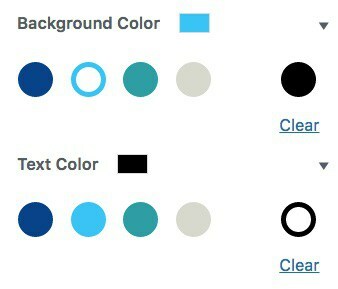 Example of a custom color palette in Gutenberg. 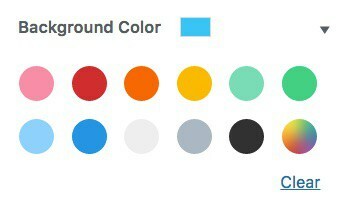 Gutenberg provides a default color palette to work with, but any theme can override this and provide their own. Add this code to the functions.php file of your theme. NOTE: Regardless of the colors you choose, you'll probably want to make sure you include both black (#000) and white (#fff). You'll notice in the image above, there is no custom color wheel. That's because I have disabled that as well. We've published another article on how to disable custom colors here. Brian Gardner has also written a nice article on this topic, and extended it to work with Genesis theme colors in the Customizer. I hate the Gutenberg editor. I haven’t upgraded my wordpress blogs to 5.0. still they are on 4.9 version. The only reason why I think people dislike Gutenberg is because they don’t like changes. As I’ve observed, most of these people are the ones who are deeply invested into page builders like Elementor, Divi, etc. Gutenberg is not that bad at all. You can do a lot of things even complex layout with it. People like to dismiss it right away without even giving it a proper try. Like everything, there’s a learning curve but for me Gutenberg comes out naturally. Maybe because I feel that it’s a native part of WordPress. In fact, I’ve built a site using only Gutenberg and I can say that it does a lot. I’m surprised myself of what I came up with actually. If you want to see it, I can give you a link but I’m not posting it here. As all software, there will be bugs but the WordPress team is on top of it. So instead of saying it’s bad, why not give it a try and send your feedbacks to the devs so they can address it and make it better. Yes it can. The problem is, complex layouts usually don’t translate well responsively, especially when you adopt a mobile-first mindset. Mobile-first is the industry standard. Yet, unfortunately, GB doesn’t (yet?) have a mobile preview. That’s troubling. Regardless of how people feel about change, issuing a no-choice mandate (as opposed to letting the market decide) is no way to win them over. Again, such things are troubling. Instead of point fingers at the many long-time supporters of WP, perhaps it’s better to take a long hard look at leadership and how they failed to get their message across, sell their vision, etc. Unfortunately, “leadership” (and I’m now being generous) failed to own their shortcomings. Gutenberg is extremely annoying. It’s not fluid, it’s not supple, and the fact that it wasn’t designed to work with previous plug-ins: there’s just no excuse for that. To leave a writer or an editor without the ability to scroll, to force everybody to go back to the coders, is just plain sadistic. I have deadlines. I have other things to do.